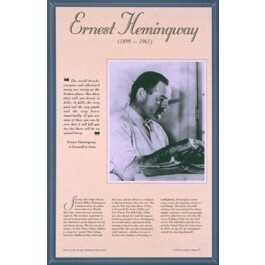 This unique educational poster of author Ernest Hemingway features a striking photo of him, as well as a quote from "A Farewell to Arms," and concise biographical text summarizing his life and career. 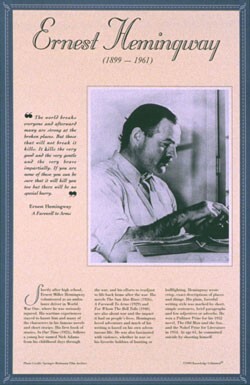 Ernest Hemingway loved adventure and much of his writing is based on his own adventurous life. He won a Pulitzer Prize for his 1952 novel, "The Old Man and the Sea." In 1954 he won the Nobel Prize for Literature. This poster is a great way to introduce students to this important American writer.